Compact, rugged and virtually maintenance free, the LV-90 Series level switch can effectively meet the needs of large volume OEM users. The sensor is designed for side mounting into tanks that have restricted space or inaccessible tops or bottoms. Construction is all polysulfone (PSF) for compatibility with a wide range of chemicals and is suitable for food processing requirements. Magnetic SPST switch operation is normally open (dry) when units are installed with float downward, or normally closed (dry) when installed with float upward. The LV-100 Series liquid level switch requires side mounting into vessels, and is designed to provide maximum reliability. The unit should be installed in environments that are free from excessive contamination and high shock. Models are available with either Buna or 316SS float material, and both have positive float and cam action. 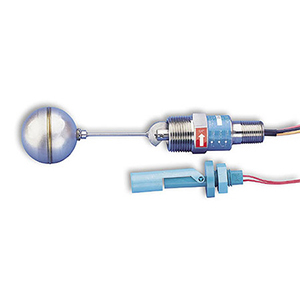 These versatile level sensors feature SPDT switches that can be wired as either normally open or normally closed; other models feature SPST switches which are dedicated as either normally open or normally closed. For high pressure applications, the switches constructed of 316SS will withstand up to 900 PSI. 20 V A Polypropylene 225°F 150 PSI 0.8 min. 20 V A Brass/Buna 180°F 150 PSI 0.8 min. 20 V A 316SS 300°F 900 PSI 0.9 min. 100 V A (N.O.) 316SS 300°F 900 PSI 0.9 min. 100 V A (N.C.) 316SS 300°F 900 PSI 0.9 min.